Sinj offers characteristics making it a unique location within the Dalmatian hinterland, one that you must visit whilst enjoying your luxury villa in Croatia. The town of Sinj is full of heritage and culture that creates a warm place, with friendly locals who will welcome you with open arms. The surrounding towns of Trilj, Dicmo and many others are all quaint, picturesque places that are well worth a venture. Sinj is set back from the Adriatic Sea by around 30 kilometres presenting a slightly more peaceful holiday location, surrounded by the wonderful mountains of Kamešnica, Svilaja and Dinara. Due to its mountainous surround the town sits elevated 320m above sea level. The Alka, is the most famous annual event to occur in Sinj each year. 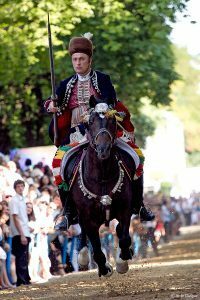 This is a“knights tournament” which takes place for three days at the beginning of each August to commemorate the great victory of the Sinj soldiers in 1715 against the vastly superior Ottomoan forces. 700 locals managed to defend Sinj against tens of thousands of attacking Turkish soldiers. Horsemen parade the proud streets and take part in a competition in which they aim a lance at a metal hanging ring and points are awarded depending on where they pierce. This metal ring being called an Alka.The ceremony creates a great spectacle which draws large crowds and is not to be missed if you are near Sinj at the time. Whilst Sinj is small town, it does not lack in either culture or tradition. Sinj is also fairly accessible if you are staying in a luxury villa in Split and want to experience a true Croatian experience for a day out of your holiday. There is evidence Sinj has been inhabited since prehistoric times. A number of archaeological finds from the Copper age through to the Bronze Age are attributed to the so-called Cetina culture. After the fall of the Roman Empire in the 7th century, Sinj was inhabited by Croats, who practised Christianity and created a strong military presence. Frequent Turkish attacks led to the fall of the Cetina district and the town of Sinj in 1523 where they held it until 1686 when it was fell under Venetian rule. The Turks however, were not ones to give up easily. They continued to try and conquer Sinj, but the people of Sinj were resilient and passionate, willing to give their life for their town. In 1715, the Turks attacked Sinj for a final time. The Turkish army heavily outnumbered the Sinj defenders, who stood at only 700 compared to tens of thousands of Turks. Fighting bravely and never giving up, the Sinj soldiers won the battles as the Turks, weakened by hunger and disease, left the Cetina region. The Sinj dedicated their win to Our Lady Mary and deemed it Gods deed for them to win. The Venetians once again occupied Sinj until 1797, where Austria took leadership. Although there was a brief period of French ruling, Austria soon ruled Sinj again until 1918. Sinj, as part of the Cetina district, has always been a town of national pride and belonging to Croatia. They have often fought for Croatian language and uniting Croatia which is why it was so celebrated when they became part of the Republic of Croatia in 1992. 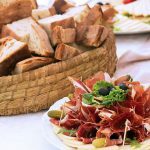 Food in Sinj combines many local cuisines and influences from the various rulings that they have had in history. Sinj is located close to the Cetina River and many local delicacies are caught there such as frogs, crayfish and Cetina trout. By far the most famous Sinj delicacies are arambašići, which is always a part of local holidays and festivals. This traditional dish is made with diced or minced beef, smoked ham or other smoked and dried meats, local spices and then spooned into sour cabbage leaves where it is then cooked slowly. If you are lucky enough to find yourself in Sinj in August, you will have the opportunity to taste traditional dishes, such as arambašići, thanks to Alka and Feast of the Assumption. There will be prosciutto and cheese, beef soup with pasta or noodles, roast lamb, roasted pork and duck in a special Sinj sauce. Desserts are similar to other traditional Croatian desserts, such as sweet ravioli, fritters and Kotonjada. Local wine favours darker varieties which are often created using both black and white grapes, a traditional method that makes fresh, smooth red wine. You don’t have to travel far in Sinj to find fresh, local food that will satisfy you and your taste buds. In March 2018 the town hosted the 13th annual National Pršut Fair. This is a gathering of the greatest cured meat producers from all across Europe. Visitors of the festival were not only treated to the finest in cured meat, but also sampled cheese, olive oil, homemade breads and wine amongst other fine cuisines. Picture from Croatia Week. Sinj is a small but vivid place that has a lot to give each and every visitor. Explore our full range of Croatian holiday villas today for a holiday you will never forget. Alka – This is a famous local festival is Sinj to celebrate the great victory of the Sinj soldiers in 1715. The proud Alka contestants ride their horses and try to pierce the alka (an iron circle) with their lances. Before the contest, the contestants parade the streets with a marching band and all the locals celebrate this great event that is about to take place.There is also a museum dedicated to the Alka which houses a permanent display including a wide variety of uniforms, equipment and weapons used by the alkars of Sinj, together with Alka statues and rulebooks presented in modern digital form. Alka Knights Court/Alka Halls – built in 1760, the original purpose of this building was as a military base for the Croatian cavalry. Today is it the seat of the Sinjska Alka and the newly opened Museum of Sinj Alka. Monument to the Alkar – one of the symbols of Sinj is located at the beginning of Sinj racecourse and marks the spot from which Alka guys start the race. Tripalo Palace – a protected monument from the 19th century belongs to the Tripalo family, who are a famous family in Sinj. It is located in the heart of the city, and it is a preserved historical landmark that is representative of its time in history. Kamičak Fort – One of the most memorable symbols of Sinj, this star-shaped fort was built in 1712 and is located in the city centre, connected with the Alka Halls. Museum of the Cetina Krajina region – if you want to learn more about the cultural and historical heritage of the Cetina Region, the museum is a must see. River Cetina – this beautiful river welcomes the adventurous in Sinj, with rafting and canoeing available. The Cetina Adventure is a competition that features kayaking, swimming, abseiling, diving from the impressive rocks and many other surprises. There is the competition Cetina Adventure that includes kayaking, swimming, abseiling, diving from the rocks, crossing rope and other surprises. As well as the river activities, the surrounding areas offer and impressive view and are perfect for hiking and cycling.